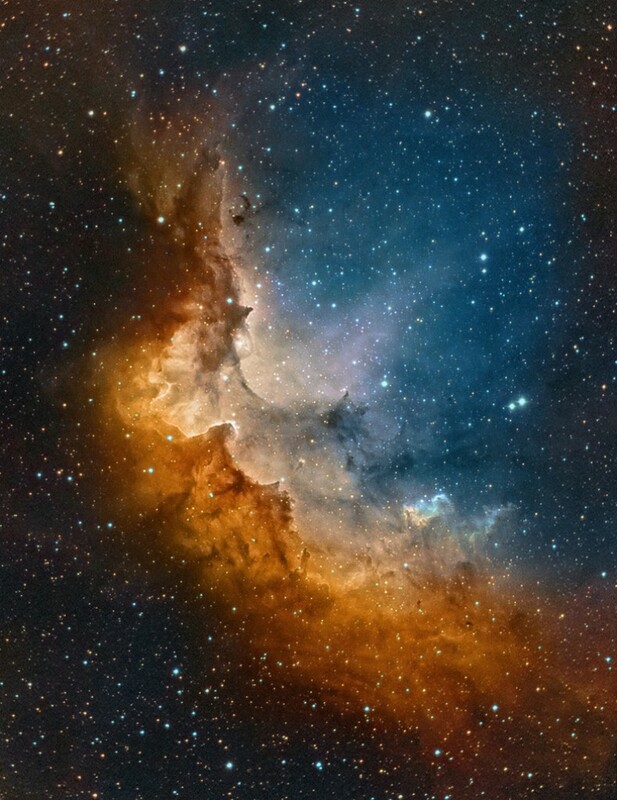 The Wizard Nebula (SH2-142) is a bright diffuse nebula that surrounds the developing open star cluster NGC 7380. It spans some 110 light-years and lies about 7,200 light years away in the Cepheus constellation. 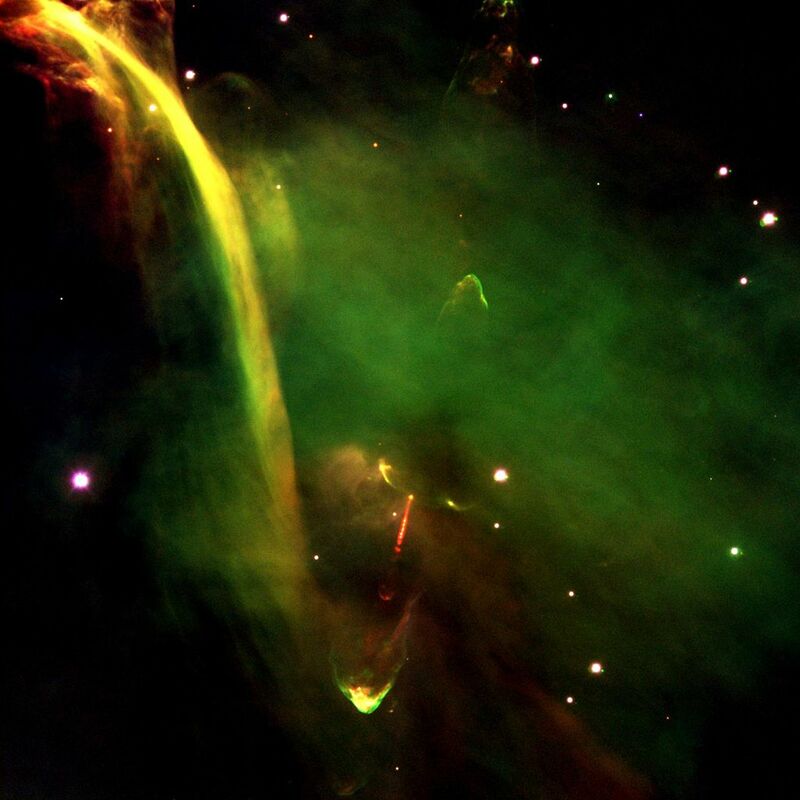 Herbig-Haro 222 (HH-222, The Waterfall Nebula), roughly 1,350 light-years from Earth in the Great Orion Molecular Cloud complex, is one of the more mysterious structures yet found on the sky. The elongated gaseous stream stretches about ten light years and emits an unusual array of colors. The Waterfall appears to converge on a bright but unusual non thermal radio source located toward the upper left of the curving structure. The red jet near the bottom, called Herbig-Haro 34 (or HH 34), is a signpost of star birth. Several bright regions in the lumpy gas signify where material is slamming into each other, heating up, and glowing. Ejected episodically by a young star like salvos from a cannon, the blobby material in HH 34 zips along at more than 440,000 miles (700,000 kilometers) an hour. When launched, the speedy jet may initially be confined to a narrow beam by the star’s powerful magnetic field. The Sunflower Galaxy (M63 or NGC 5055) is a spiral galaxy consisting of a bright yellowish core and many short sweeping blue spiral arms, streaked with cosmic dust lanes and dotted with pink star forming regions. It is nearly 100,000 light-years across, about the size of our own Milky Way and lies 37 light-years away in the Canes Venatici constellation. It is part of the M51 Group,a group of galaxies that also includes the Whirlpool Galaxy (M51). M63′s faint extended features could be the result of gravitational interactions with nearby galaxies. M63 also shines across the electromagnetic spectrum and is thought to have undergone bursts of intense star formation. Hyperion is, at 255 x 163 x 137 miles in diameter, the largest of Saturn’s irregularly-shaped moons and the largest irregularly-shaped moon in the solar system. A possible explanation for the irregular shape is that Hyperion is a fragment of a larger body that was broken by a large impact in the distant past. Hyperion’s low density indicates that it is composed largely of water ice with only a small amount of rock. It’s surface is covered with deep, sharp-edged craters that give it the appearance of a giant sponge. Dark material fills the bottom of each crater. The reddish substance contains long chains of carbon and hydrogen and appears very similar to material found on other Saturnian satellites. The largest crater on Hyperion is approximately 121.57 km in diameter and 10.2 km deep. Hyperion has a fairly eccentric orbit and it’s rotation is chaotic, that is, its axis of rotation wobbles so much that its orientation in space is unpredictable. Hyperion is the only moon in the Solar System known to rotate chaotically. It is also the only regular natural satellite in the Solar System not to be tidally locked. The Ufo Galaxy (NGC 5775) is a spiral galaxy with a high star formation rate, about 85 million light-years away in the Virgo Cluster. Astronomers have used the high inclination of this spiral to study the properties of the halo of hot gas that is visible when the galaxy is observed at X-ray wavelengths. The mechanism behind such haloes is unclear, but they are found around spirals that have a high star formation rate, like NGC 5775. 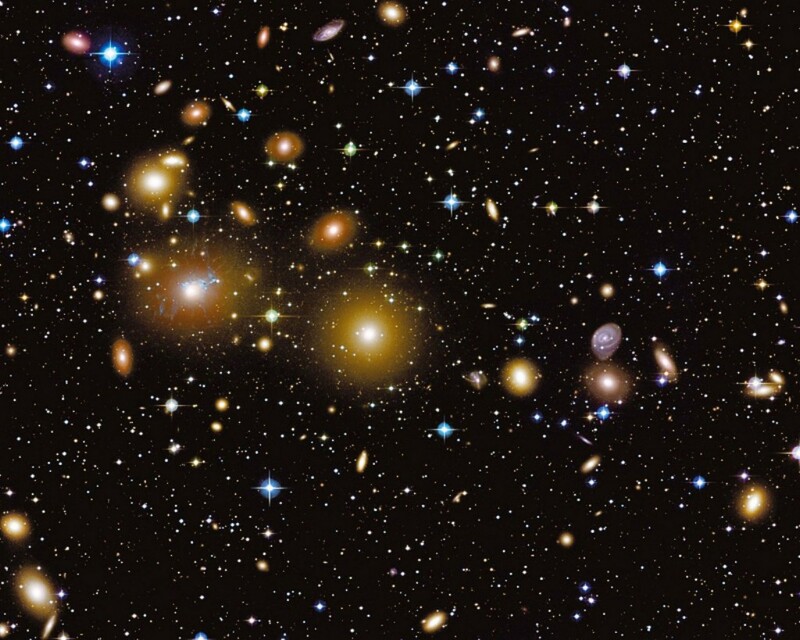 The Perseus Cluster (Abell 426) contains thousands of galaxies immersed in a vast cloud of multimillion degree gas. Near the cluster center, 237 million light-years away, is the cluster’s dominant galaxy NGC 1275 (also known as Perseus A). The Southern Pinwheel (M83 or NGC 5236) is a barred spiral galaxy, about 40,000 light-years across and 15 million light-years away in the Hydra constellation. Supernovae SN 1923A, SN 1945B, SN 1950B, SN 1957D, SN 1968L and SN 1983N have been observed in M83. Eta Carinae, a binary stellar system that is surrounded by the Homunculus Cloud, may be about to explode in a supernova. 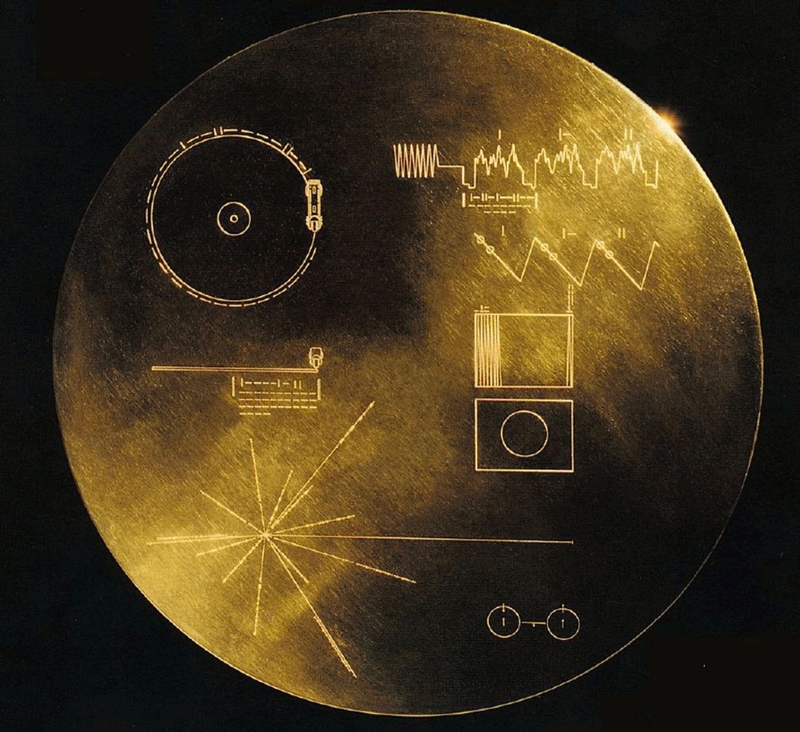 But no one knows when – it may be next year, it may be one million years from now. It is situated about 8000 light-years away in the Carina constellation. Eta Carinae suffered a giant outburst about 160 years ago. The explosion produced two lobes and a large, thin equatorial disk. The Eagle Nebula (M16 or NGC 6611) is an open star cluster surrounded by the diffuse emission nebula and H II region IC 4703. This starburst region lies 6,500 light-years away in the Serpens constellation and is home of the famous “Pillars of Creation”. The Propeller Galaxy (NGC 7479) is a barred spiral Seyfert galaxy about 105 million light-years away in the Pegasus constellation. A recent minor merger caused its unique appearance, a bizarre backwards spin with arms opening in a direction opposite to the optical arms. Supernovae SN 1990U and SN2009jf occurred in NGC 7479. 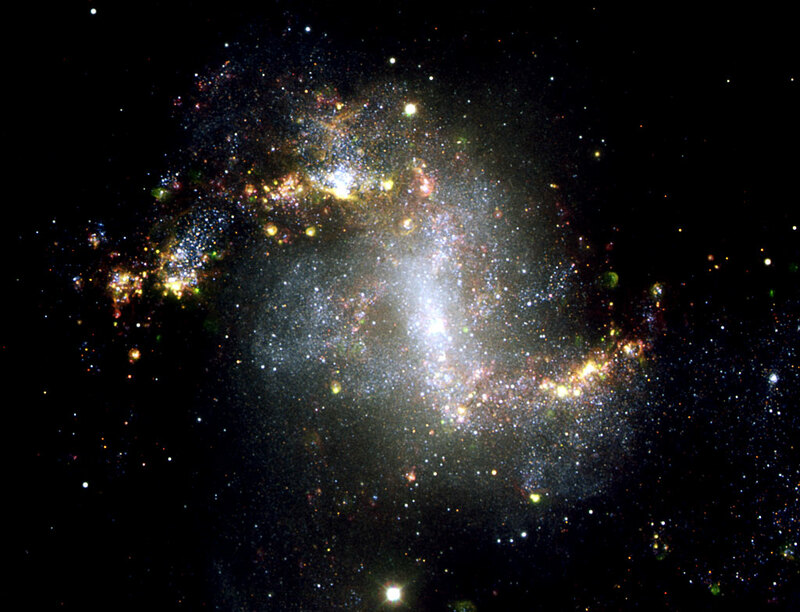 Topsy Turvy Galaxy (NGC 1313) is an unusual barred spiral starburst galaxy that spans about 50,000 light-years, some 1500 light-years away in the Reticulum constellation. It has a strikingly uneven shape and its axis of rotation is not exactly in its centre. 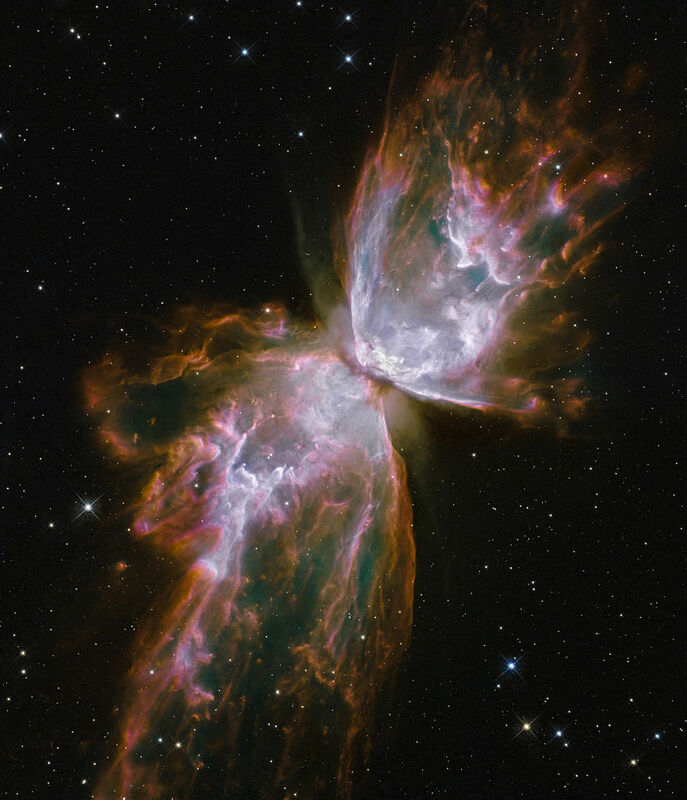 NGC 6302 (the Bug Nebula, Butterfly Nebula, or Caldwell 69) is a bipolar planetary nebula, about 3,800 light-years away in the Scorpius constellation. The very hot central star, first a red giant, will become a white dwarf. The Rosette Nebula (Caldwell 49) is emission nebula and H II region in the Milky Way, 130 light-years across and 5,200 light-years away in the Monoceros constellation. NGC 2244 is the open cluster within it, with hot, young stars formed from the nebula’s matter. 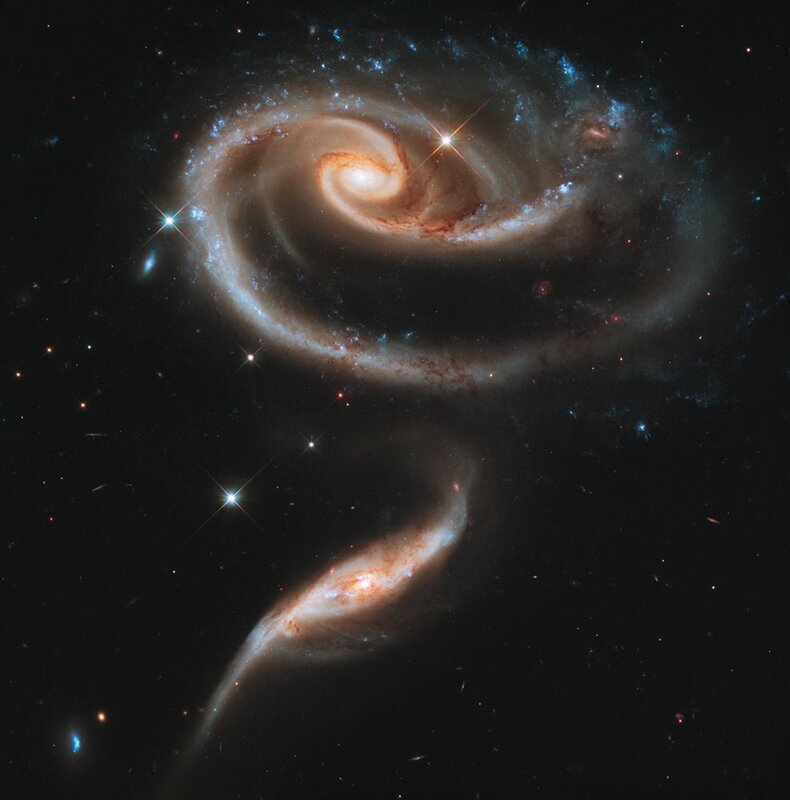 Arp 273 (UGC 1810, the larger spiral galaxy and UGC 1813, with intense star formation) lies 300 million light-years away in the Andromeda constellation. UGC 1810 has a disk that is tidally distorted by the gravitational tidal pull of UGC 1813. 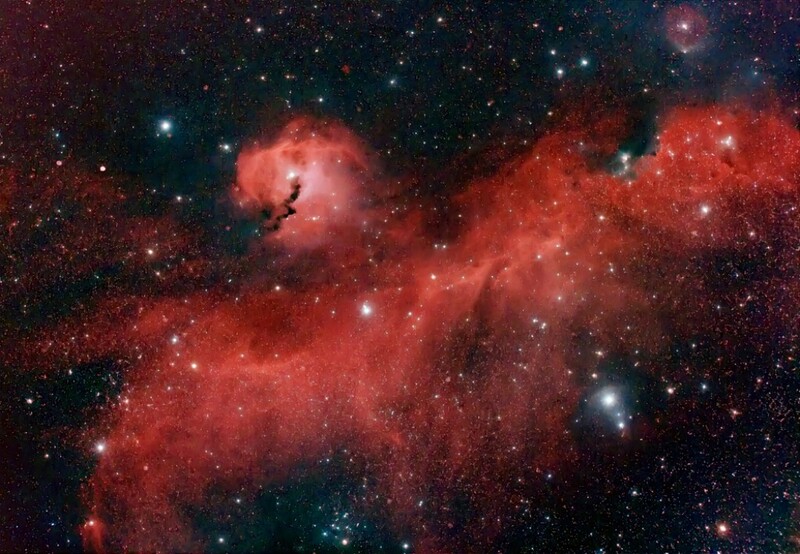 The Seagull Nebula consists of IC 2177 (the wings), a region of nebulosity and NGC 2327 (the head), a roughly circular HII region centered on the Be star HD 53367, some 3,650 light-years away between the constellations Monoceros and Canis Major. 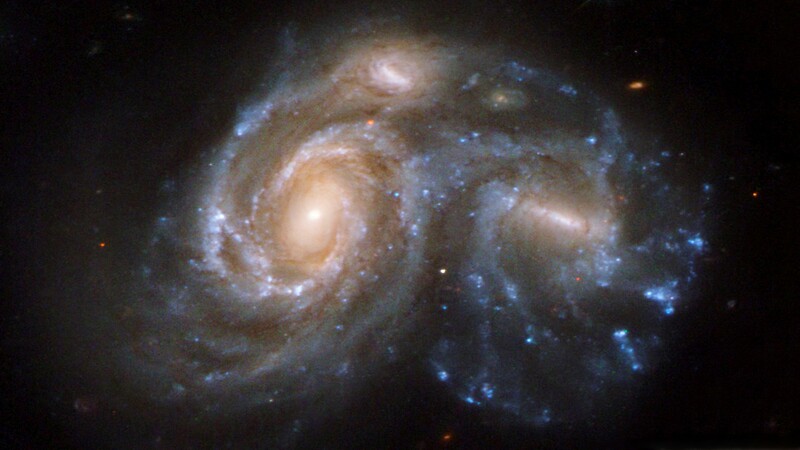 The Whirlpool Galaxy (M51A or NGC 5194, right) and (M51B or NGC 5195, left). The Whirlpool Galaxy is a grand-design spiral galaxy, interacting with NGC 5195, a dwarf galxy. 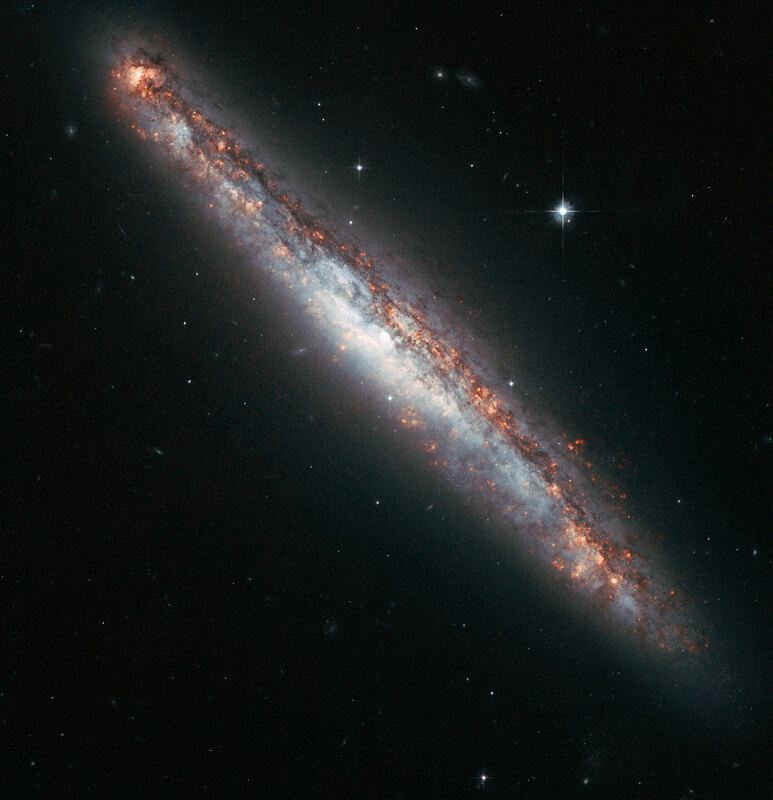 Both galaxies are located 23 ± 4 million light-years away in Canes Venatici. Thor’s Helmet (NGC 2359) is an emission nebula that lies approximately 15,000 light-years away in Canis Major. The central star is a Wolf-Rayet star. The Mice Galaxies (NGC 4676A right, B left) are two spiral galaxies that lie 290 million light-years away in Coma Berenices, whom are in the process of colliding and merging. Their name refers to the long tails produced by tidal action. 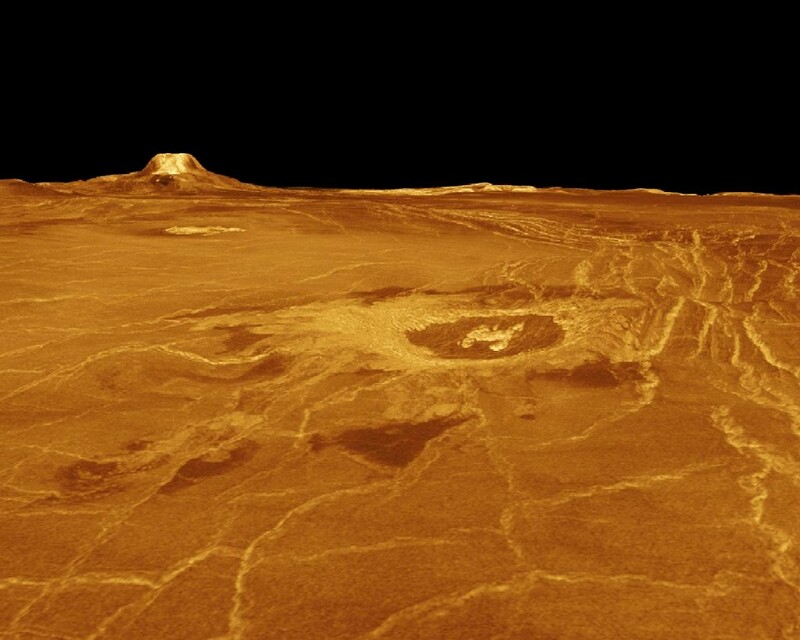 Venus’s Eistla Regio in 3D view, produced from Magellan radar data.